Pharmacists Manitoba said the province should cover the cost of Naloxone, a drug that can reverse the effects of an opioid overdose. The province should pay for a life-saving drug that reverses the effects of an overdose, says a provincial pharmacist advocacy group. Pharmacists Manitoba sent a letter to Manitoba Health earlier this year asking the government to cover the price of Naloxone, a drug used to treat overdoses on opioids including fentanyl and carfentanil. The treatment is currently available in kits with syringes and instructions for free to opioid users at Street Connections in Winnipeg, but everyone else — including family and friends of users — has to pay for the drug out of pocket at one of the handful of pharmacies that choose to keep it in stock. The issue is compounded by a recent announcement from Winnipeg police that the synthetic opioid carfentanil is present in Winnipeg. The deadly drug is 100 times more powerful than fentanyl, another opioid, and emergency workers have said it takes more than four shots of Naloxone to treat overdoses — double the amount stocked in Street Connections' kits. While Manitoba pharmacies can sell Naloxone without a prescription if they choose, not all of them stock the drug. Barret Procyshyn, vice president of Manitoba Pharmacies, said that's in part because of the cost. He said the group's letter to Manitoba Health in June explained that if the government paid for the drug, pharmacies could be the distributors. Other provinces, including Alberta and Ontario, pay for Naloxone to be given for free to opioid users, as well as to family and friends at pharmacies, he said. "We want to be part of the answer," said Procyshyn. "We've told Manitoba Health and our government that we want to be a part of the answer and recommended that they provide funding. We just haven't heard back." Procyshyn said pharmacies could also help distribute Naloxone to rural areas that don't have access to free-kit programs like Winnipeg's Street Connections. 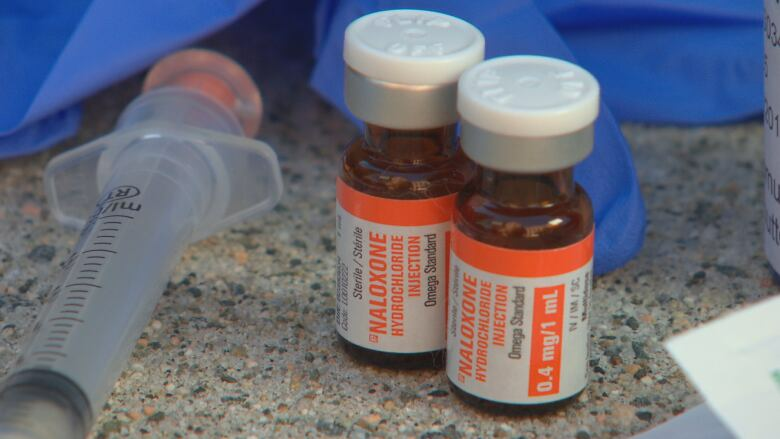 That program has already given out some 120 Naloxone kits, and at least nine of them have been used to reverse overdoses, according to the Winnipeg Regional Health Authority. The project might be expanded throughout Manitoba, but that hasn't happened yet, she said. "Fentanyl is a problem in every part of Manitoba," Procyshyn said. "There's not a hospital in every town but there is a pharmacy and we want to be part of the process." "I think pharmacists in Manitoba want help," he said. "We just need a little bit of help getting this all set up and ready to go." A provincial spokeswoman responded to a CBC request for comment, and said work is underway to develop a distribution program to cover the entire province. In the meantime, she said Manitoba Health encourages Pharmacists Manitoba to work with their members to discuss the benefits of stocking Naloxone kits for their patients. "The province recognizes the urgency of this issue," she wrote. "The department is balancing timelines for implementation with the time needed to properly review and consider all possible factors that will ensure a strong program that benefits as many people as possible." The province is consulting with stakeholders for the development of the program, she said, and considers it important to look into opportunities to partner with a range of groups, including pharmacies, to make the kits widely available.